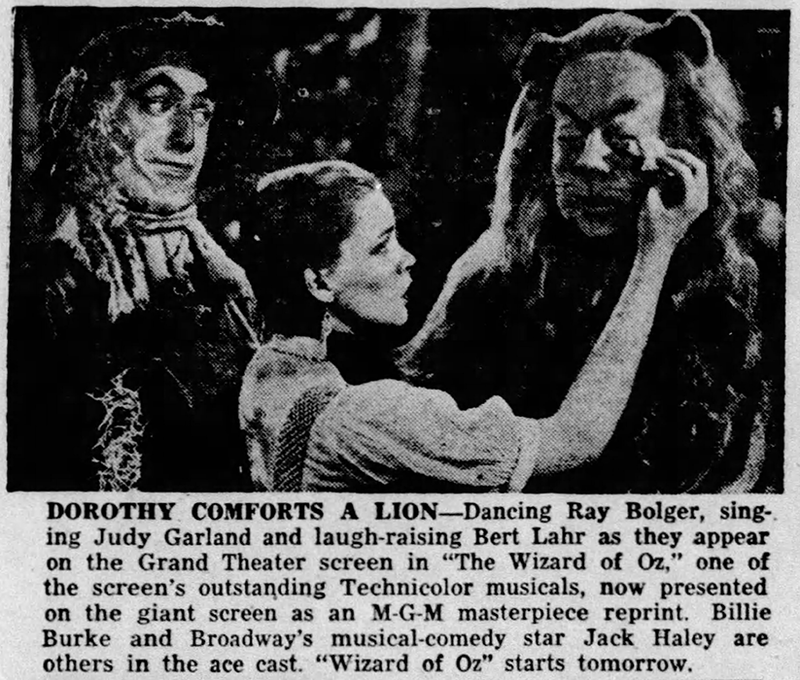 July 14, 1939: This two-page ad appeared in the “Film Daily” trade publication promoting the upcoming release of The Wizard of Oz and several other MGM films. July 14, 1943: This photo was approved on this day by the Advertising Advisory Council for publication. 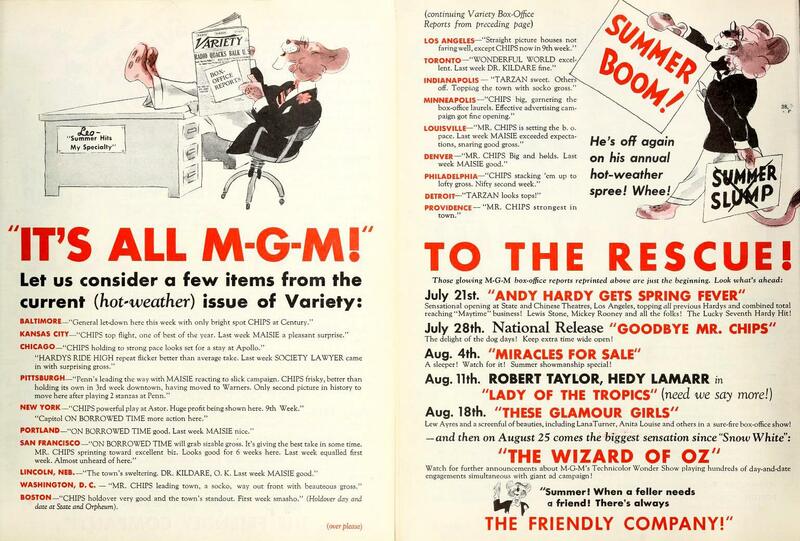 MGM used it as part of their promotion for the upcoming release (November 26, 1943) of the last of the Judy/Mickey “Let’s Put On A Show” musicals, Girl Crazy. 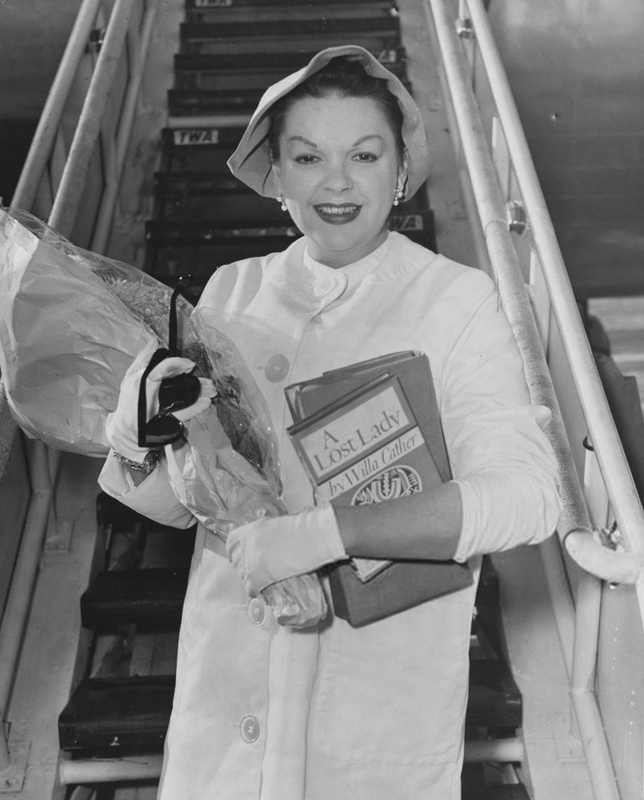 On this day Judy was on her second USO tour of Army camps and did not return to LA and MGM until mid-August. THE CAMERA KEEPS AND EYE ON JUDY … between scenes of Metro-Goldwyn-Mayer’s “Girl Crazy.” Judy co-stars once again, and for the eighth time with Mickey Rooney. She sings and dances to music by George Gershwin, played by Tommy Dorsey and his orchestra. There’s Nancy Walker, Rags Ragland, Frances Rafferty, Gil Stratton and Robert Strickland in the supporting cast. 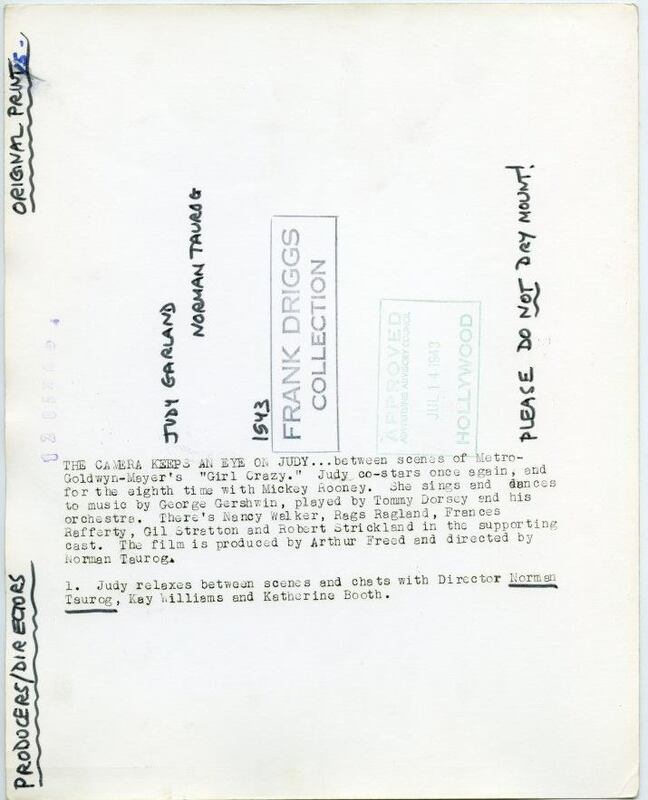 The film is produced by Arthur Freed and directed by Norman Taurog. 1. 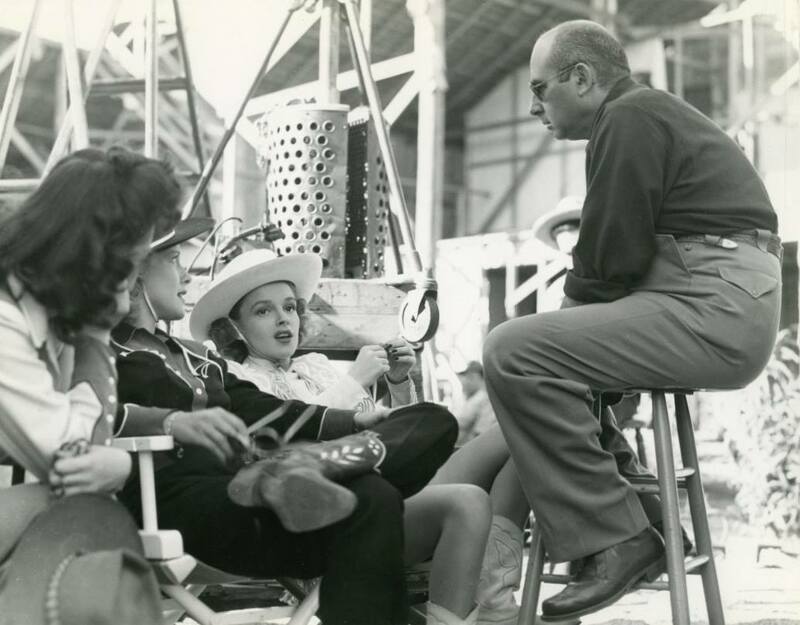 Judy relaxes between scenes and chats with Director Norman Taurog, Kay Williams, and Katherine Booth. July 14, 1944: For unknown reasons, Judy had a late start scheduled for her rehearsals of “The Interview,” a.k.a. “A Great Lady Gives An Interview,” a.k.a. “Madame Crematante” routine for Ziegfeld Follies. 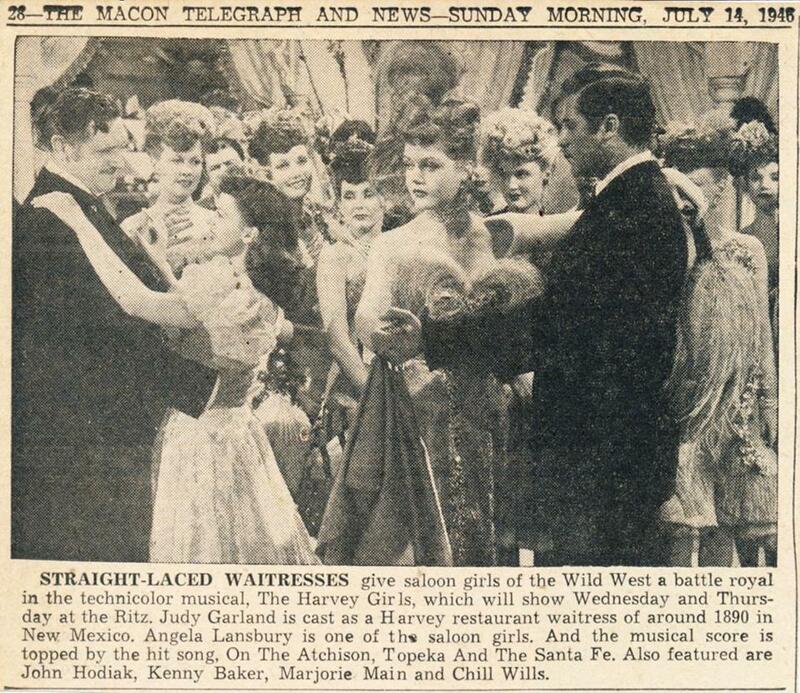 Time called: 4 p.m.; dismissed: 9:30 p.m.
July 14, 1946: This blurb appeared in the “Macon Telegraph and News – Sunday Morning” newspaper promoting Judy’s latest hit, The Harvey Girls. 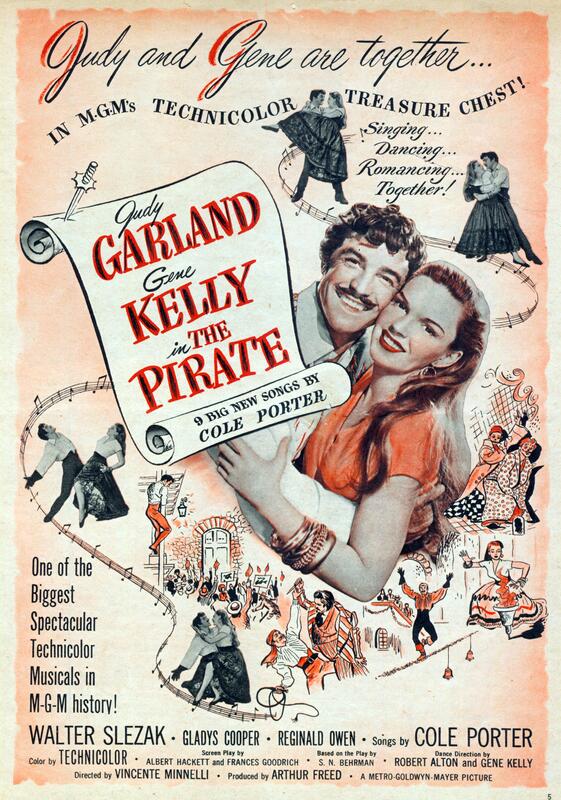 July 14, 1947: Judy and Gene Kelly pre-recorded “Be A Clown” for The Pirate. 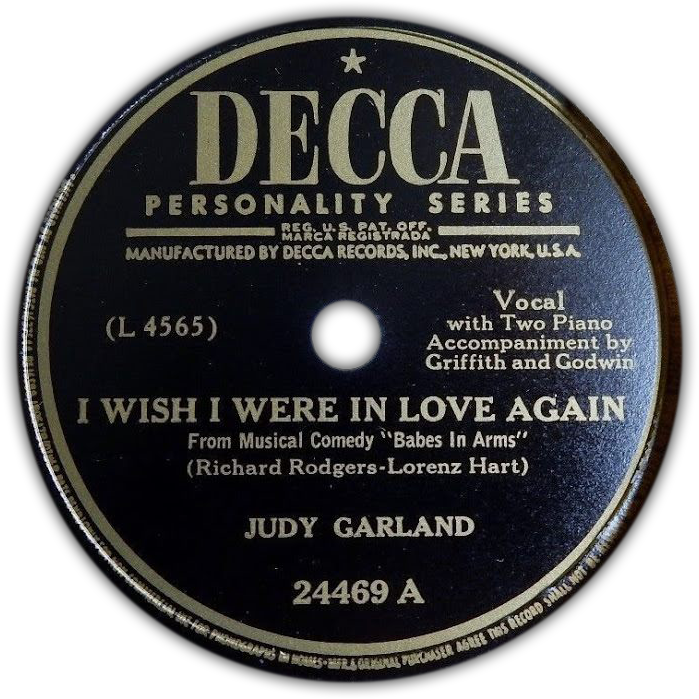 Time called: 1 p.m.; dismissed: 4:50 p.m.
July 14, 1948: Decca Records released their last Judy Garland single, Decca Single #24469 which featured “I Wish I Were In Love Again” and “Nothing But You.” For both songs, Judy is accompanied by Griffith and Goodwin on twin piano. Judy recorded both on November 15, 1947, which was her last recording session for the label. “I Wish I Were In Love Again” is not to be confused with her popular duet of the song with Mickey Rooney, recorded a year later at MGM and released on MGM Records. All of Judy’s Decca recordings have been released over the years in various formats. The best release is the 2011 boxed set “Smilin’ Through The Singles Collection 1936-1947.” It’s the definitive collection of Judy’s Decca recordings featuring new remasterings of the recordings with the latest, and amazing, technology. Learn more about Judy’s Decca records and all of the various releases at The Judy Garland Online Discography’s “Decca Records” Section. Disc image above provided by Rick Smith. Thank you, Rick! 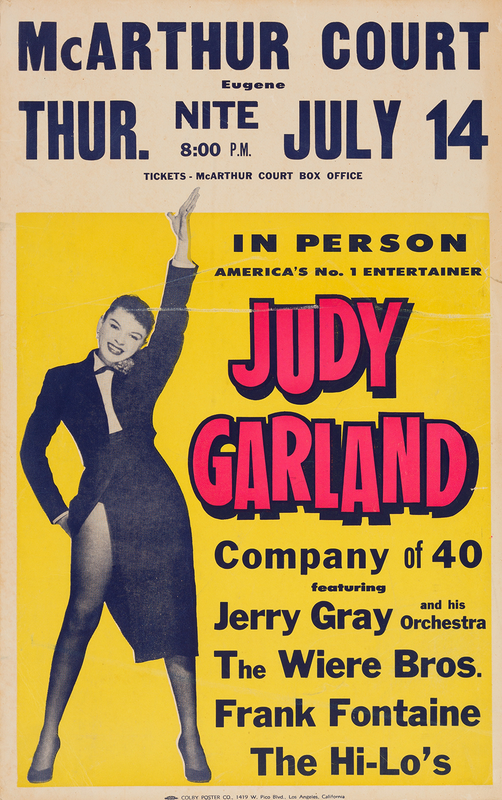 July 14, 1955: Judy’s concert show, “The Judy Garland Show” was touring the west coast, including Oregon, Washington, and British Columbia. On this day she was in Eugene, Washington. This ad was used to promote the show. The article at the top right explains Judy’s arrival and how the reporter/photogrpher team were dubious about the reception they’d get since Judy “has been termed ‘so temperamental. '” It also reports about Judy’s recent smash success in Long Beach, California. 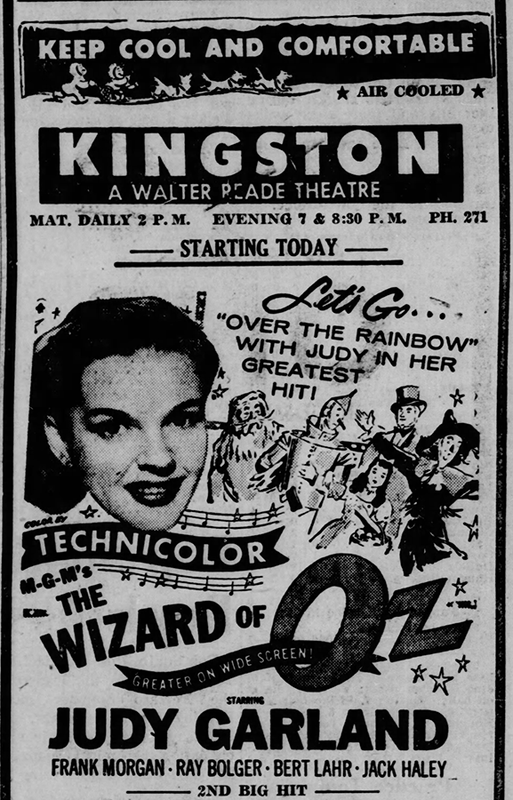 Also on July 14, 1955: The re-release of The Wizard of Oz was still opening in theaters around the country. This was the film’s last re-release before it was sold to TV. The rest, as they say, is history. 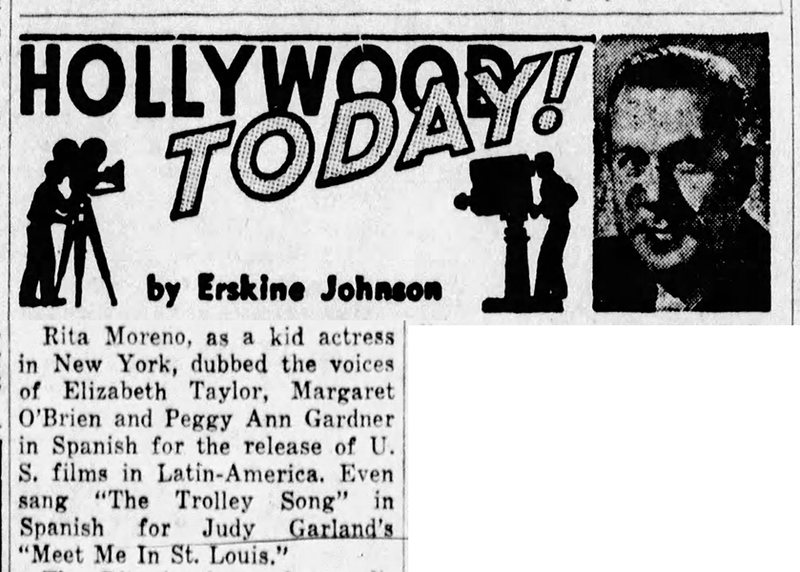 Also on July 14, 1955: Erksine Johnson’s column included this paragraph about Rita Moreno’s dubbing jobs, which allegedly included singing “The Trolley Song” in Spanish for Meet Me In St. Louis in the Spanish speaking markets. it’s inclear if this is true or just more fiction from the columnists. 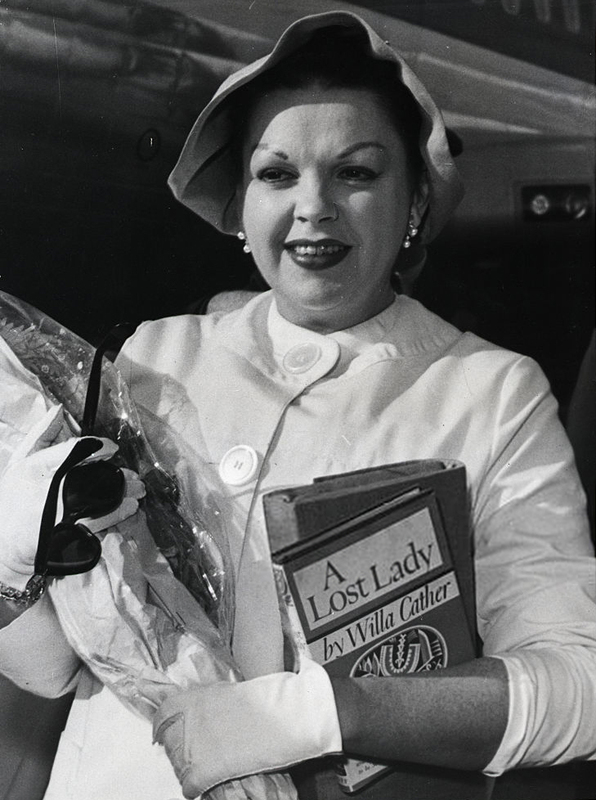 In 1962, Judy would lose the supporting actress Oscar to Moreno. Judy was nominated for Judgment at Nuremberg, Moreno for West Side Story. Check out The Judy Roo’s Extensive Spotlight Section on Meet Me In St. Louis here. 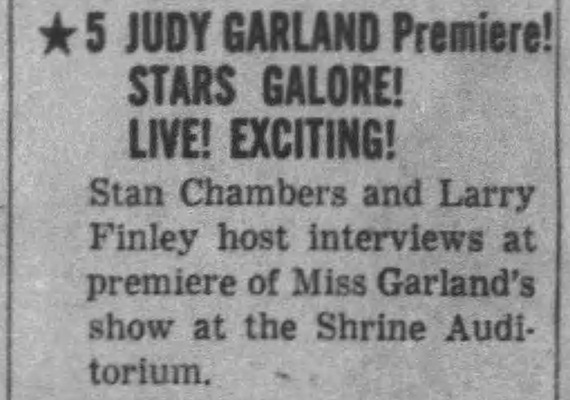 July 14, 1959: Judy’s opera house tour continued with her opening night at The Shrine Auditorium in Los Angeles. It was the final engagement of the opera house tour. The final night was Saturday, July 18th. The arrivals were covered by the local TV station, but that footage is not known to exist. July 14, 1960: These photos were taken of Judy upon her arrival in London, England. She gave a press conference in London during whcih she said: “I’ve never been so happy in my life. My children – three of them – are well integrated. My marriage is just pervect. My voice is just great.” This is true, at least the voice part because in just a few weeks she began recording what became known as “The London Sessions,” which are some of her best studio recordings. 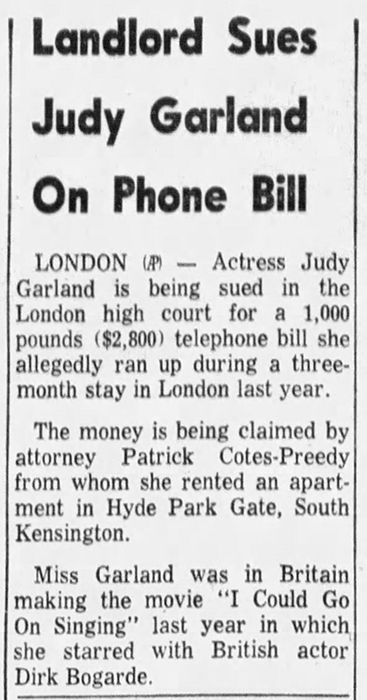 July 14, 1963: Judy was sued by attorney Patrick Cotes-Preedy for 1,000 pounds ($2,800) in unpaid telephone bills. 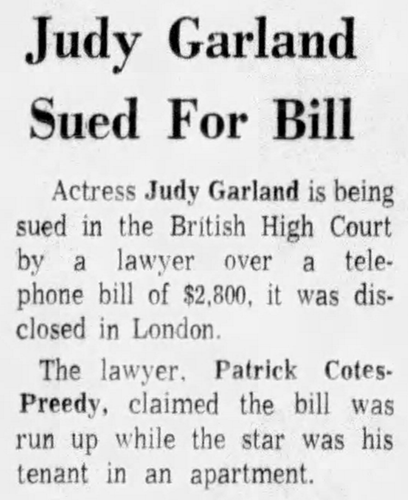 Judy stayed with Cotes-Preedy while she was in London the year before filming I Could Go On Singing. 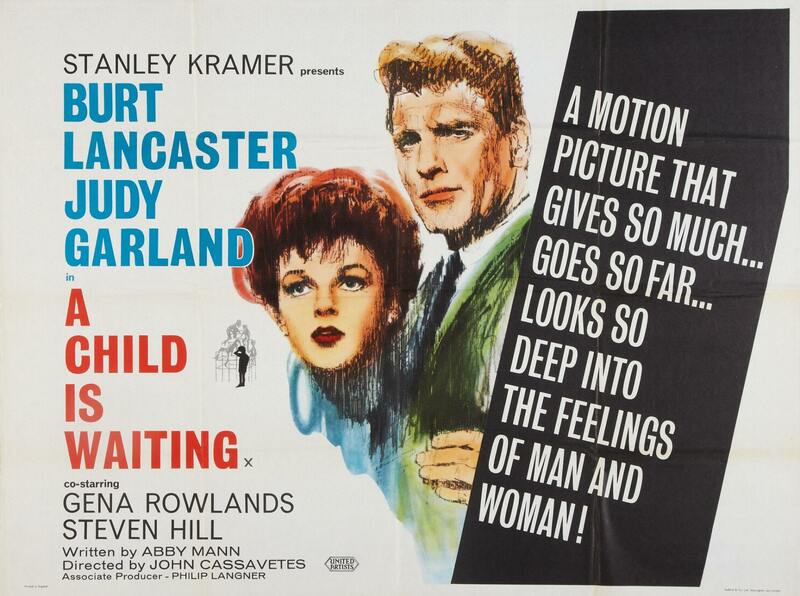 July 14, 1966: London’s “The Times” published its review of A Child Is Waiting which for some reason had not made it over to the UK since its release in 1962. 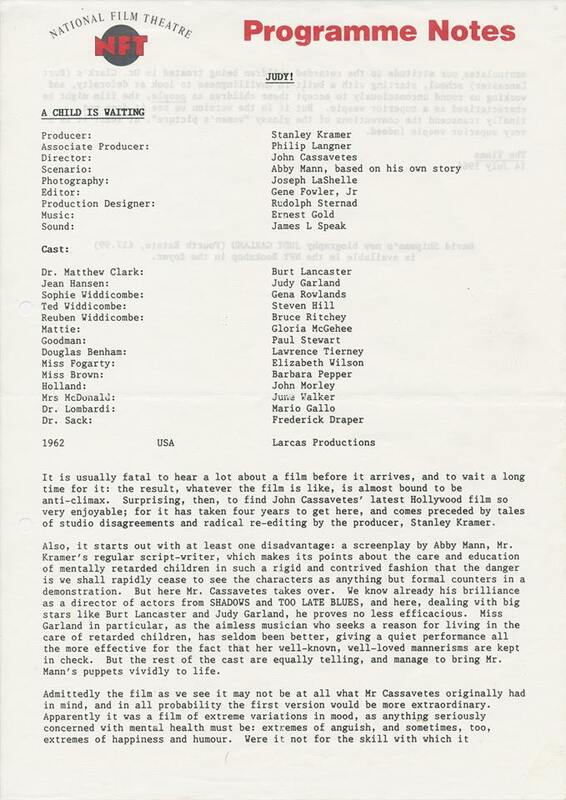 The review is republished here by the National Film Theater for a showing in 1993. 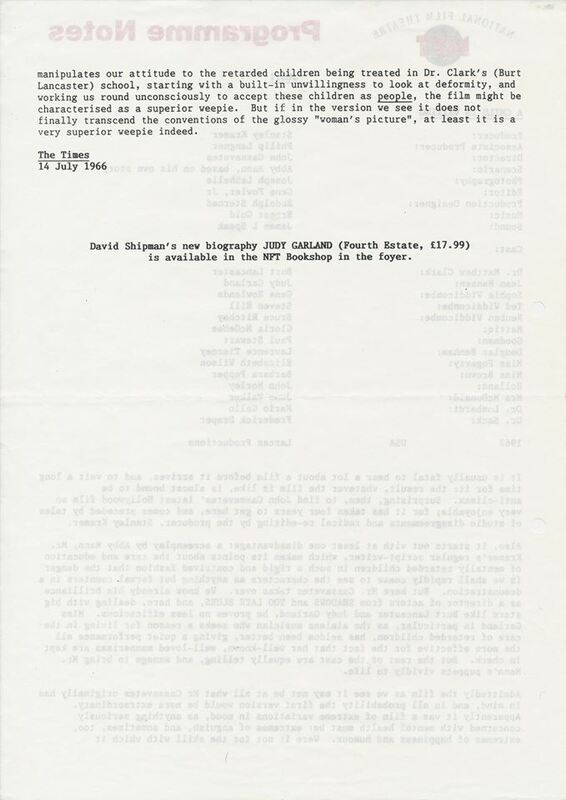 Note the notice at the end of the printout about David Shipman’s new Judy Garland biography. Shipman was a program consultant to the National Film Theatre. July 14, 1989: Drama in Munchkinland! 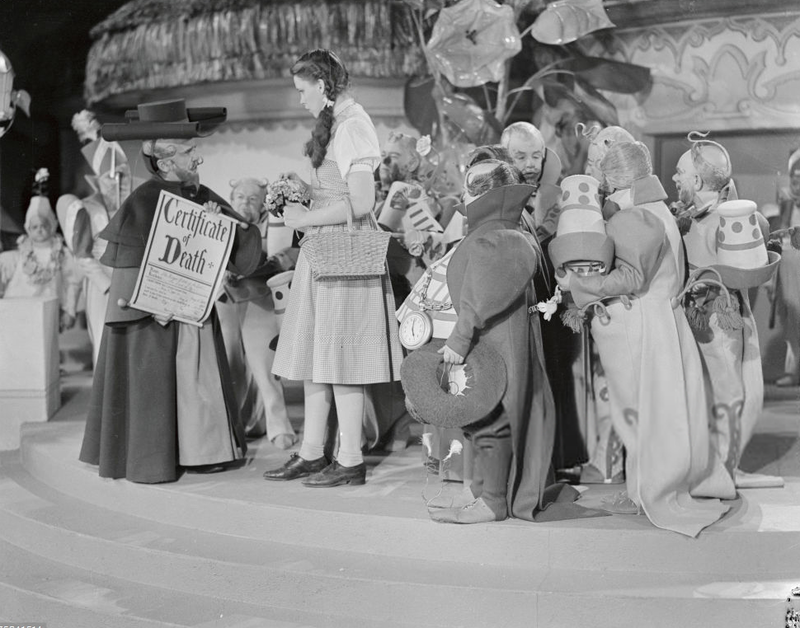 The 50th anniversary celebrations for The Wizard of Oz were underway, with the special edition VHS and laserdisc versions of the film coming in August. 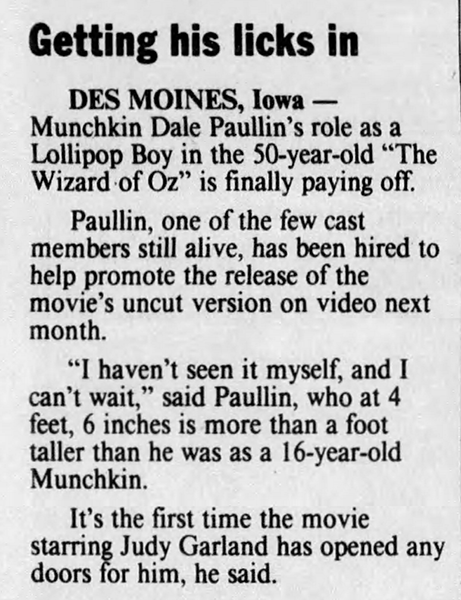 The little people who played the Munchkins were getting much deserved attention, but one little person was cashing in even though, according to the rest of the real Munchkins, he was never a part of the film. Another interesting post. 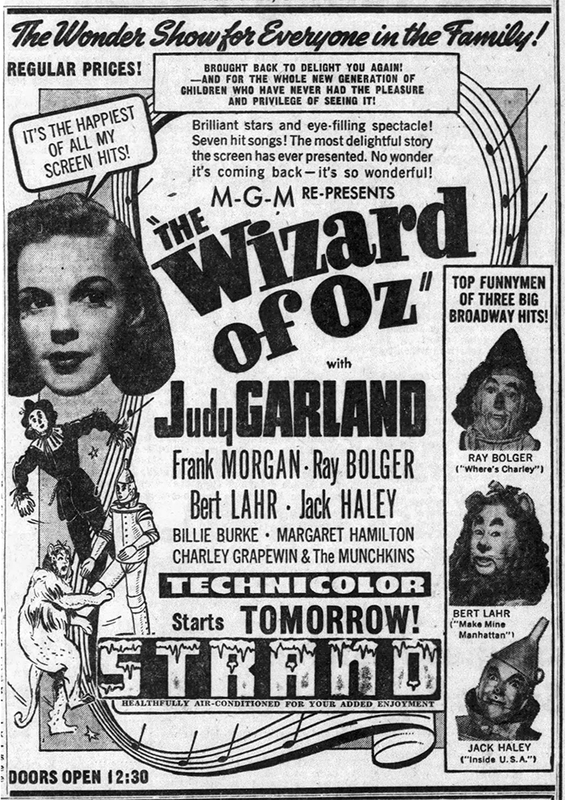 What surprises me is how LONG the theatrical runs of Judy’s films were. “The Harvey Girls” was released in January of ’46….but still playing in July??? There were tons of movies released every week, so I always thought the runs of old films were much shorter than today. What I continue to learn from this great site! While going through the newspaper archives it’s surprising to find that some films were still playing well over a year after their release. This is due to the fact that sometimes it took a while for the films to make their way from the big cities down to the small towns. I think that sometimes films had return engagements due to their popularity. I suspect that sometimes the studios sent films out to pad the bills. The studios owned the theaters back in those days. However, these weren’t official, promoted “rereleases.” I have even seen “Pigskin Parade” in theater ads as late as 1940 and 1941.